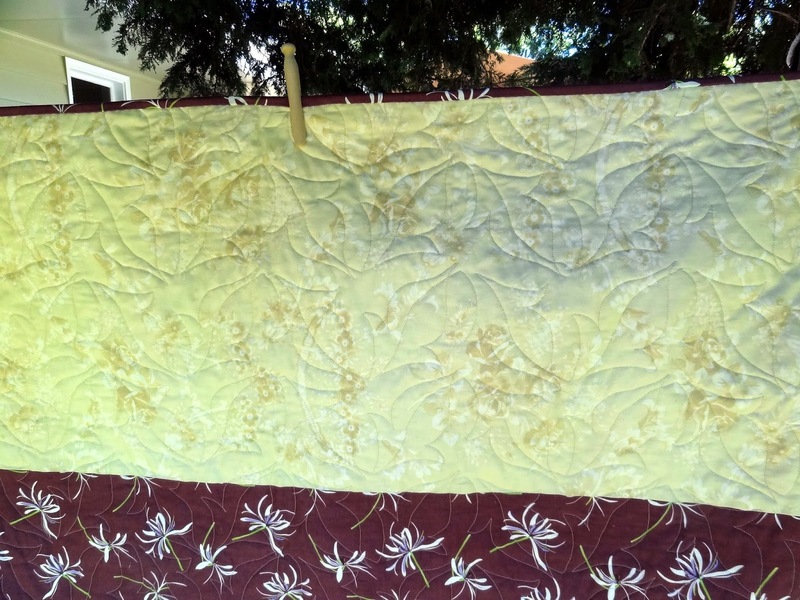 Squash House Quilts: Paul Bunyon's Long Johns - Quilted Finish! Can you believe it? 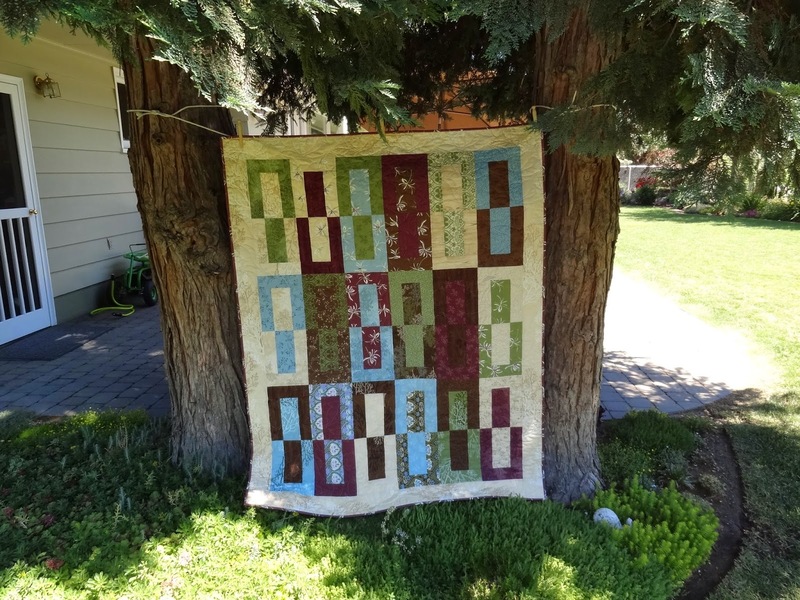 Another one off the longarm! Gracie May was much more cooperative on this one - I made sure she was in morning sleep mode first. You may remember that I Supreme tested this pattern for Stephanie over at Rummage (formerly Loft Creations) last year. The original pattern does not have a border. I added a small border to make just a little more room for Mr. Squash to use as a lap blanket in the winter. The pattern is called Long Johns which you can get HERE. I am calling it Paul Bunyon's Long Johns because I used a fabric called Twiggy by Sanae for Moda. It's a line several years old that I happened to have in my stash. I had some of the Twiggy burgundy fabric left over and another fabric from stash to make up enough for the backing. I decided Paul Bunyon would have wanted leaves - and big ones - so I quilted it with a large leafy panto. We're having August weather already. Makes me wonder what August will be like! This is the fourth year on my table grapes and I can't believe how many there are! They're huge already so I think it's going to be a good and juicy crop! My Honey Crisp is coming along. 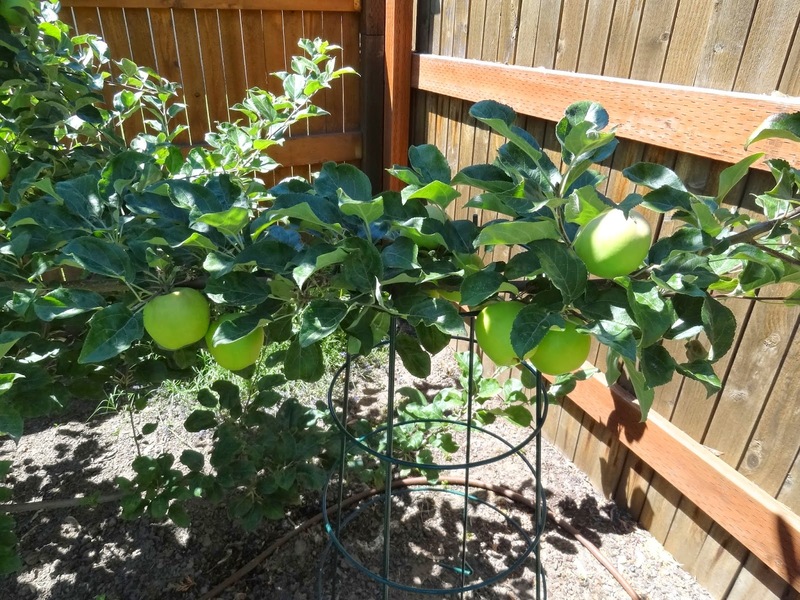 Our lawn fellow said I should only have 2-3 apples per branch, but come on - these are Honey Crisps - I can't bear to sacrifice any of them! So I used a spare tomato cage to support this one branch. Had to show you Mr. Squash's marigolds in front of the tomatoes. Aren't they goreous? Finally, I wanted to share a little tidbit I discovered by accident. We're having a bumper blueberry crop - Mr. Squash picks every other day right now. I get maybe 2-3 quarts each time he picks, so I'm freezing them as fast as he can pick them (of course we save some for eating fresh). Up until this year I would spread them on a bare sheet pan and freeze before placing them in ziplock bags. They always would get hairy no matter what. So I tried lining the pan with parchment - and no more hairy frost! I now do this with all fresh fruit I freeze and it works perfectly every time! I'm sure this varies from climate to climate but for us it works great. Well Mr. Paul Squash Bunyan is going to be cozy in his new Winter quilt. :o) You are on fire with your quilting. The leaves are perfect. Oh goodness...Squash House Farms is open for business. Your bounty is gorgeous -- I remember marigolds help repel insects but they sure add a pop of color! Your Long Johns are just fabulous. Your crops are really starting to produce now. What will you do with all of the grapes? That is always my challenge. Your fruit looks delicious!And your leafy quilting is wonderful. You're a natural at longarming. 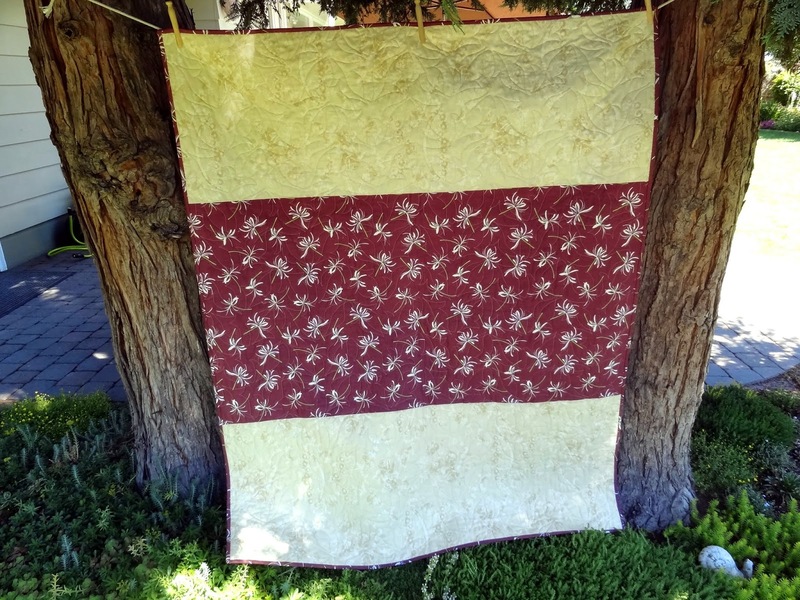 The quilt is great and your quilting works perfectly here. I made this quilt one row wider and longer, and added a small border to make it large enough to keep the grandfathers warm when they take a nap or go out in a wheelchair at the nursing home. - Our apples are like cherries at the moment! Your quilt is wonderful! Love how you added the borders and machine quilted it with leaves. Well done! Strange, I've frozen many, many pounds of blueberries on a tray and never had them get "hairy" as you call it. Were they totally dry when you put them in? I always wash mine and then spread them out on old towels to air dry before freezing. Who knew about parchment paper? Great tip! I hope you have a bumper crop of honeycrisps! They're looking really good. Great quilt! Maybe there is a little room for you to snuggle under there with Mr. Squash too! Mr squash should be quite cosy in those long johns! It turned out wonderfully! Your garden is fab. 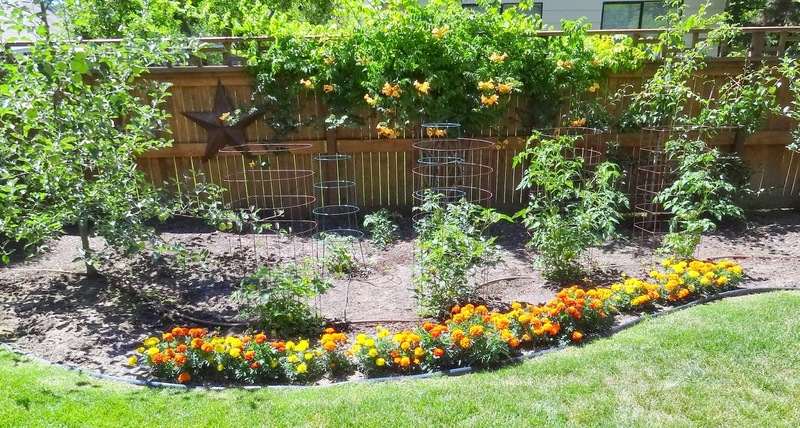 I might be able to grow marigolds , maybe. Do you want a little giggle? At first I thought you were referring to John Bunyan, preacher and author of Pilgrim's Progress, and didn't understand why twigs and leaves etc were relevant. I googled him in the end and found out that I was wrong and Paul Bunyan was someone entirely different. Now I understand the reason for the name. It's a lovely quilt and the quilting is just right for it. Thanks for the garden pictures too. I always love to see them. I know Mr Squash will love his new quilt - and I'm so happy to see that you are able to do some quilting! Your gardens are just beautiful - what a gorgeous display of fruit - I'm so jealous! We have a few grapes and THREE blueberries! It's amazing to me how much better fresh blueberries taste than the ones you buy in the store. I love your long johns quilt and the quilting you did on it. So happy that Gracie May cooperated. The garden looks abundant. Marigolds are quite useful and it's nice that they are so pretty too! 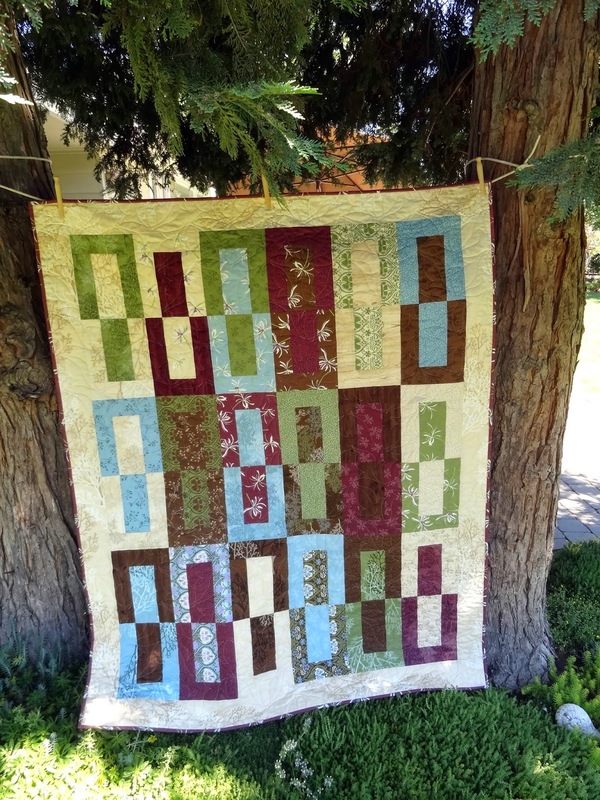 Love the fabrics you used in your Long Johns quilt. Neat quilting pattern too. Whoa! you certainly have a lot of grapes. 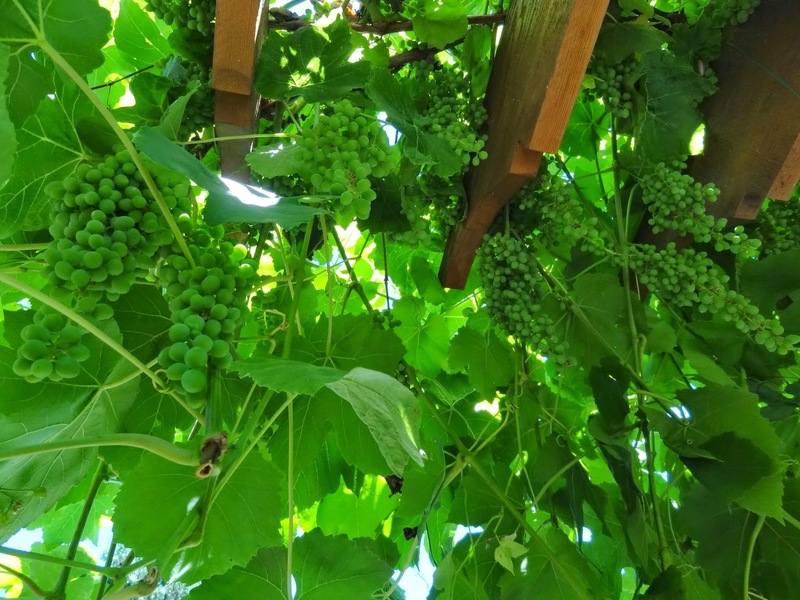 We have a grape vine over part of our patio and it has quite a few grapes hanging. I can wait for them to get ripe. Are your grapes green or purple? Well done! It is great to get a lingering project finished. We had grapes from a friends house in Oxford. It made good wine- we were pleasantly surprised as it is unusual to grow grapes in the UK.